One of the best ways to find out how the police work and to get answers to your questions is to attend an open day. Most police forces across the UK open their doors to the public at least once a year. They can be held at force, divisional or local level or even as part of a joint event with other emergency service organisations such as the fire service. Such events are free to attend with the option to make a donation to the charity of the day. Their 2014 force open day was held from 11am until 3pm at the Police Headquarters in Stafford. It was billed as a family fun day with lots of activities for both adults and children who could take a look at police vehicle displays including force motorcycles, helicopter and police dog demonstrations. Other highlights included a guided tour around their contact centre and the chance to try on a police uniform. It was also possible to have fingerprints and a mug shot taken. Policing information and advice was available throughout the event from the police and a range of partners including Staffordshire Fire & Rescue, the West Midlands Ambulance service, Crime prevention, Safer Roads Partnership and many more. There was also a bouncy castle, a climbing wall, dance group performances, a face painter and a magician. As well as refreshments available to buy, there were also picnic areas for those taking their own food. This year’s event will be held on the 28th June 2015 again at the police Headquarters, Weston Road, Stafford. 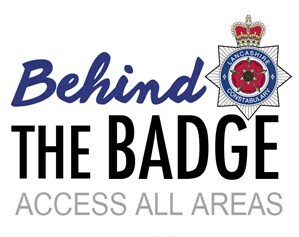 In 2014 the Lancashire Constabulary ran a Behind the Badge Weekend, which provided opportunities to see what goes on behind the badge and meet local officers. The Police and Crime Commissioner Clive Grunshaw presented some of the projects the force is involved in and the work they are driving forward to benefit Lancashire’s residents. This was an opportunity for local people to learn more about the role of the Commissioner. The two days were fun-filled with displays from the police dogs showing how hard they work and the situations that they need to be able deal with. Mounted officers demonstrated the skills of their horses with coordinated movements and dealing with large crowds of people. There were many of the vehicles past and present on display for all visitors to see and also test what it might feel like to drive them. Officers were present, willing to answer questions and demonstrate how the equipment worked. Visitors were allowed to tour the communications rooms, seeing some of the vintage technology as well as the modern-day communications hub. There were many interactive displays in the Forensics section with presentations of Evofit, a facial recognition system, computer fraud demonstrations and staff on hand to explain how new sophisticated techniques can be applied to fingerprinting. Originally the open day was to be staged on just the Sunday but with the 8000 tickets quickly snapped up, an extra 2500 tickets were issued for the Saturday. The Sussex Police held a series of live events over a 10-day period in 2013, inviting members of the public to visit police stations and join officers on patrol across East Sussex. They saw it as an opportunity for people from across the Division to get involved in day-to-day policing and offering them a chance to ask questions they have always wanted to and to see areas of police stations they would never normally get the chance to see. The public were also invited to watch officers out and about in Hastings on a Saturday night as they policed the town centre. There was a live broadcast on the website of officers working the evening shift showing the range of incidents they dealt with and the activities they undertook. It was possible to ask questions of the officers during the shift via Twitter. People were able to see uniforms, cars and equipment through the ages, get locked up in the old cells and see how modern technology has transformed policing during an open day at Grove Road Police Station in Eastbourne, where tours took place every half hour, lasting for an hour. With speeding being a hot topic for the police a live broadcast about the issues was run from Bexhill. Sussex Police Headquarters was open for a family fun day at the weekend featuring a police dog demonstration, allowing visitors to climb into a custody van, visit the Communications building, tour the historic Malling House and have their fingerprints taken by crime scene investigators, as well as have fun on the bouncy castle. The open days at Eastbourne, Lewes and Headquarters were all free, with donations accepted for local domestic abuse charities. To find out about similar events in the locality you are interested in, either check the press for details or visit the force website and check out their Events/News pages. Alternatively you could email or call their Press or Media Relations Department for relevant information. Must see if there is an Open day in Warwickshire.